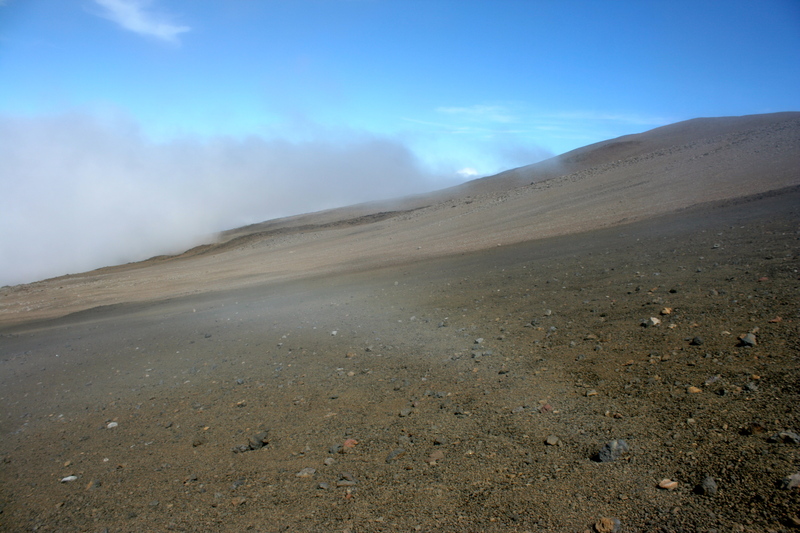 Hiking Mauna Kea, Hawaii | ride. travel. live. 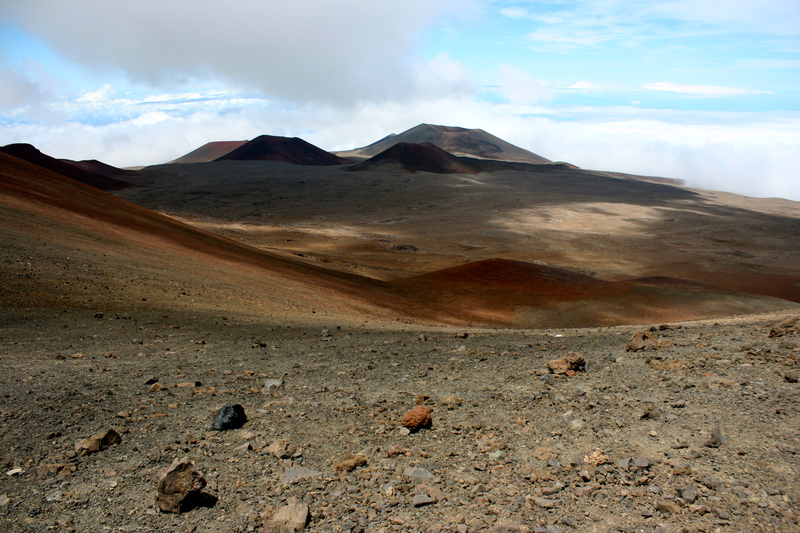 There are a couple of normal ways up Mauna Kea, the tallest in Hawaii at 13796′, 4205 m. The relatively easy way is to drive, although the road is winding, very steep, and a gravel road that is banned by most rental car companies on the Big Island. The other way is to hike from the visitors’ center, which is at 9300′, so it’s a long way up and a 6-7 mile long hike one way. 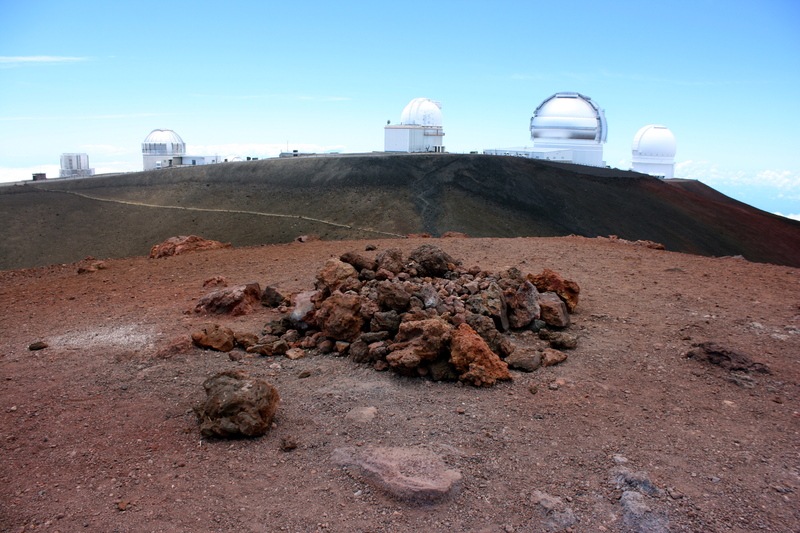 While the trail is not that difficult, it’s at altitude, with little chance in Hawaii to adjust, since the settlements are generally 4000′ and below. For the most part, hikers are coming from sea level and having to negotiate the thin air and brutal UV at that altitude. The good news is that the weather is almost always clear at the top, even if it’s raining heavily in nearby Hilo, or even at a lower altitude. I hiked it a few days ago, leaving the town of Volcano in a downpour, getting my fill of rainbows and rain showers in Hilo, and then heading up a rainy and then foggy saddle road (Hawaii 200). 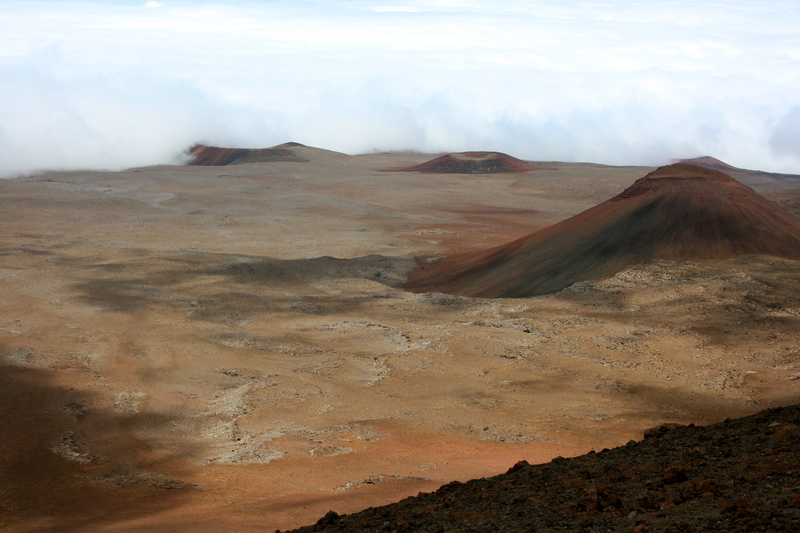 The turnoff to Mauna Kea lies in the middle of a lava field mixed in with rangeland, and then the road really climbs, through the fog, a few sparse trees, then into a reddish barren landscape. Where the pavement ends, the trail begins. 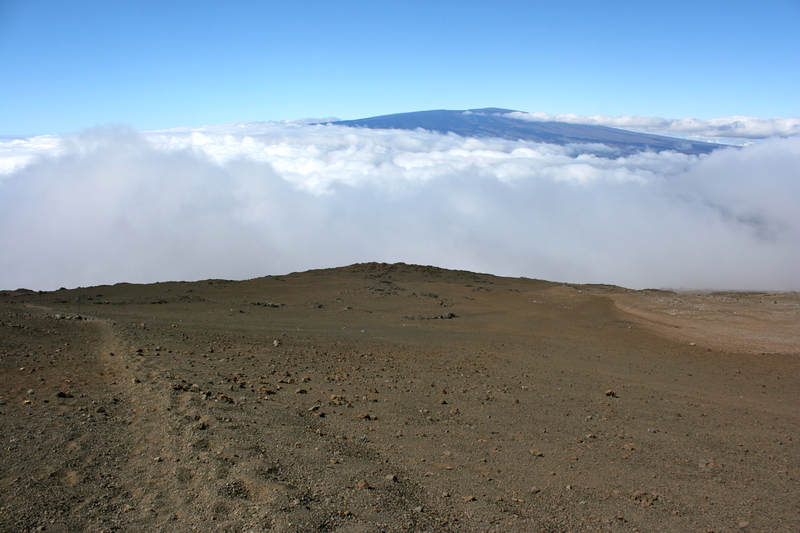 Mauna Loa, sitting pretty above the clouds. You are never that far from the road, which parallels the trail. The lower part of the trail is very steep, but then it ascends at a steady grade, with another steep-ish climb near the nearly-dry Lake Waiau (13020′, 3970 m). The trail joins the now-paved road near the lake, goes for another mile along the road, and then branches for a final pitch up to the top. Exhausted yet? I was, and although I intended to hitch a ride down, I walked downhill more than 3 miles before someone took pity on me and gave me a ride back to the visitors’ center. The last push to the summit. The telescope complex at the top, rather populated and busy, actually. The upper part is dotted with a large complex of telescopes, taking advantage of the superb atmospheric conditions and clear weather. 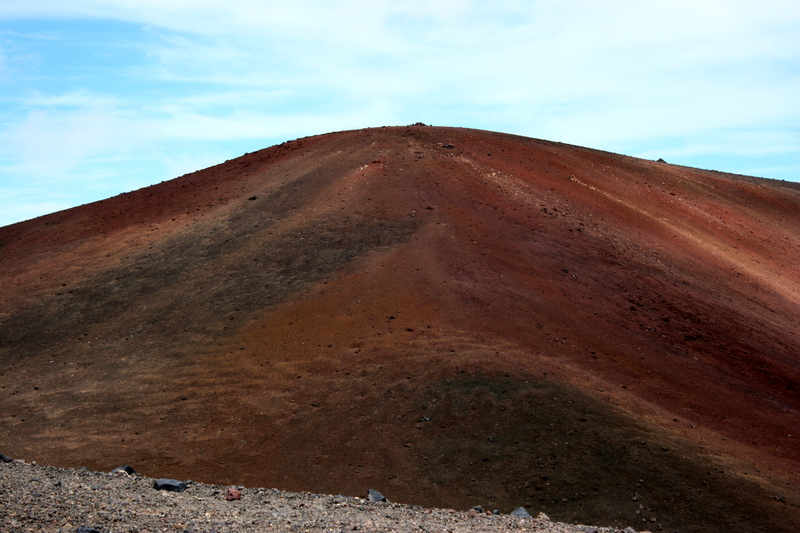 The mountain is an alien landscape, barren and reddish, perhaps a bit like Mars up there. Temperatures hover in the 30s and 40s, even when it’s warm and humid below, and the weather patterns normally suppress the clouds to below 11000 feet. This part of Hawaii is not the tropical beaches and rainforest, and attests to the incredible geographic and biological diversity of the state. Summit view, a Martian landscape way up there. Oh, and avoid the trail on Mondays and Tuesdays, when helicopters hover overhead, and snipe at the various invasive animals that are eating the native plants, so don’t be a target! By evening, I was back at sea level, walking along the oceanfront. Unreal!